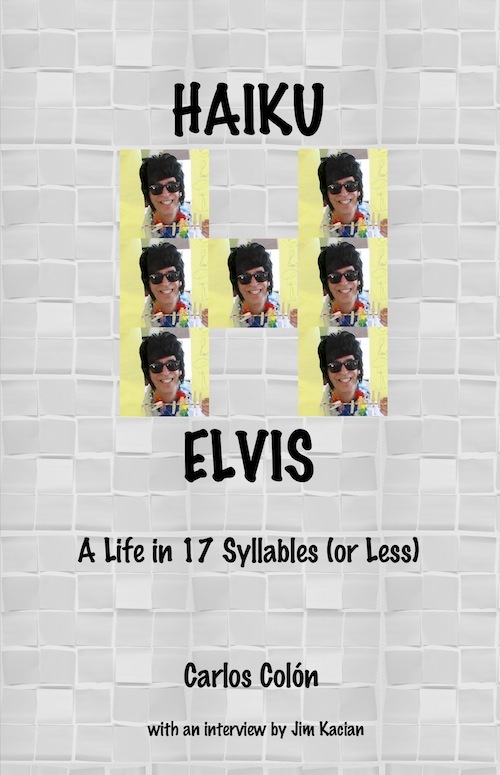 Order your copy of Haiku Elvis – A Life in 17 Syllables (or less) for $14. A book of poetry is often judged by its relevance to its contemporary cultural or historical period. Equally impor­tant is its ability to engage the reader. Carlos Colón’s Haiku Elvis is both culturally relevant and inspiring — to sing, to dance, even to dash off a few haiku or a song. Haiku Elvis lives at the quirky extreme of East-meets-West…​Japanese haiku as “Jail House Rock.” Its author, Carlos Colón, channels more than writes, and in the process answers a question that he alone in the universe has dared to ask: What if the King returned to this world as a haiku poet? The answer: hilarity. 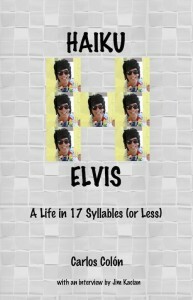 Although the concept of haiku poems about Elvis seems hilariously funny, this collection is surprisingly poignant. We remember “The King” by his iconic photographs, his news headlines, and his catchy song hooks, and those imagistic moments lend themselves well to the form of haiku. These haiku and senyrū capture both the bigger-than-life personality of Elvis Presley and the pathos that was surely part of his storied life. Sometimes making us laugh, other times opening a window to what must have been moments of sorrow or loneliness, Carlos Colón has brought this great entertainer back to life, both on stage and off. It’s a great read! Praise be. Elvis speaks to us again through Brother Carlos Colón. He has perfected the Heavenly Haiku, brethren and sistern, and has done the King proud.